For anyone dreaming about turning a hobby into something one can actually get paid to do, Paul Lempa is living proof that it's possible. Growing up, the Jersey City resident was into collecting sports cards and autographs not unlike other guys his age. 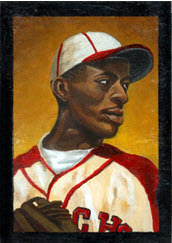 But Lempa also liked to sketch his favorite athletes, and he drew on the look of baseball cards, especially older baseball cards, for inspiration. Though he didn't pursue formal art education, Lempa stuck with his hobby, continuing to draw and paint. He even expanded his repertoire by doing more elaborate artwork on actual baseballs and footballs. That determination has paid off over the past few years. With original sketch cards making their way from non-sports cards to sports products of all types and becoming increasingly popular, card manufacturers have had to secure the services of more and more artists. Lempa was able to show some of his work to Topps representatives in 2007, and they ended up tapping him to create a number of 1/1 sketch cards for 2008 Stadium Club baseball. Those cards were inserted one per case, and it's not uncommon to see the sketches done for the most popular players for sale on eBay for triple-digit prices. More of Lempa's art can be found on sketch cards in 2009 Topps Baseball, and he's currently switching gears from baseball to football doing artwork for the company's National Chicle inserts that celebrate cards from the 1930s featuring the likes of Bronco Nagursky and Knute Rockne. Lempa's subjects will be current NFL players, most notably Tennessee rookie receiver Kenny Britt. Since he works mostly at night while his four children are sleeping, he's got a busy schedule ahead of him to get the cards done. “I have to do one every two nights for the next 60 nights," Lempa said to HudsonReporter.com. “I have so many projects to do. It's crazy and I really don't have the time, but I'll find a way to get it done." Some famous sports figures have also commissioned Lempa to do pieces for them. College basketball coaching greats Dean Smith and Roy Williams asked for painted baseballs of Babe Ruth and Mickey Mantle, and Hall of Fame hurler Bob Feller received an original painting that he sends out when he answers autograph requests. According to the FAQ page on his personal website (www.paullempa.com), it can take anywhere from six to 30 hours for Lempa to complete a painted baseball. His most intricate balls have artwork and statistics on alternating panels or panoramic images that cover the entire sphere. Those interested in commissioning Lempa are encouraged to out Lempa's site for information. His pricing varies depending on the complexity of the project, with sketch cards running between $75 and $300 and painted baseballs ranging from $250 for one-panel scenes, up to around $750 for panoramas.